Pets finally feel like a part of the family. Walking into the room for The Sims 3: Pets demonstration I was slightly circumspect about what I would find. I like The Sims, and I've been telling an avatar of myself to use the restroom, shower, cook, clean, eat, and be social since I got my hands on the very first installment. I've been amazed at myself for finding joy in virtually carrying out the tasks that I hate having to deal with in my daily life. To be honest, I haven't quite figured out the reason for this joy...I just know I have it. Having said that, I've never really been a fan of the "Pets" titles, starting with the Unleashed expansion for the original Sims. The previous forays into pet territory have felt contrived to me. Your pet is only as good as the quick burst of the social bar when you're lonely. You can customize appearance, especially in The Sims 2, but it requires a more-than-basic knowledge of the customization interface. They have personalities, but only vaguely, and mostly based on training. Once trained, they add essentially nothing but a possible cash influx when you sell them. These were my opinions, anyway, and I was wary. I shouldn't have been. 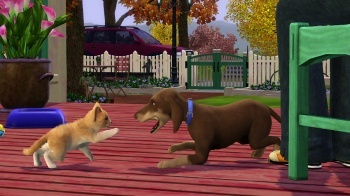 In The Sims 3: Pets, there are over 100 breeds of cats and dogs to choose from. Out of the box there's a pit bull that looks eerily like my own. Once you select a breed the aesthetic customization options are nearly endless. Bigger nose, easy. Tiny tail, short legs, Dumbo ears? Yes. Two pink spots behind Tabby's right ear? Absolutely. On top of the ridiculously expanded visual options, you assign traits to your furry creatures. Fido can be smart, or dim. He can dig through your trash or bring your mail. Clueless, Feral, Genius, Friendly, Hunter, Digger...fantastic. I think what I'm most excited about, the thing that makes all the difference for me, is the introduction of your pets as controllable sims. You can guide them to perform their necessary bodily functions (Yay?) and interact with other animals or people, they can even get jobs and make you some extra money. If you're lonely you can take 'em out on the town, to a park or a bar, and have them "Fetch a Date". I know actual people that do this. Is your sim president of the Lonely Hearts Club? Take Lassie to the bar and have her be cute as a button for every potential date in the place, 'til you casually stroll over and strike up a conversation. See, you can be that guy! Lifetime Achievements are exchanged for a mystery journal that offers rewards for completing specific tasks. Your pet is finally an active member of the household. The Sims 3: Pets will be released across multiple platforms, including the PC as an expansion, the 360, PS3, and 3DS as a standalone. The 360 has the bonus of Kinect functionality, allowing you to navigate your menus and chain your commands via voice instruction. Exclusive to the PC/Mac versions, you can buy a horse. Awesome. Finally, with the 3DS version you can trade your pets over StreetPass. Also, there will be a limited edition pack that contains exclusive breeds. Heyo!